SKIATOOK, Okla. – Osages will soon have an opportunity to live in an income-based housing addition here on the city’s southwest side. The Osage Nation Housing Department released preliminary information about a proposed housing division planned in Skiatook on Oct. 28. Officials from the Nation and a Native American-owned planning, architectural and design company presented the subdivision plans, which will comprise up to 25 three-, four- and five-bedroom houses in its first phase with construction starting in early 2015. Housing Department Director Andrea Kemble said the Nation is using federal Native American Housing Assistance and Self Determination Act (NAHASDA) grant money awarded to the Nation for building the development. She said the development will be built on 60 acres purchased by the Nation located about 1.5 miles south of Rogers Boulevard off Lenapah Avenue. Kemble said the development will be comprised of rental housing and houses-to-own with up to 25 units slated for phase one. She also said the Housing Department is now accepting applications for this housing subdivision. The division housing availability will be based on the applicant family’s income per federal housing guidelines. Osage preference will also be given priority and non-Osage Native Americans may also apply, Kemble said. The Nation worked with planning, architectural, design firm Blue Star Studio Inc. on the division plans that were presented at an Oct. 28 public meeting in the Skiatook Osage Casino Hotel. Blue Star Studio keeps a Pawhuska office in the Business Development Center west of the Pawhuska Indian Village and its staff includes CEO/ Director of Operations Jon Red Corn, Principal Architect Scott Moore and assistant project manager Ace Elsea. Red Corn, son of ON Assistant Principal Chief Raymond Red Corn, introduced Moore, who discussed the division plans at the meeting with approximately 30 attendees. According to Blue Star Studio’s project portfolio on its website, the company has also worked on plans for an arts/ entertainment venue intended for people with disabilities in Albuquerque, N.M. and a transitional living center for at-risk youth in Santa Fe, N.M., and the company has done presentations on the Rosebud Sioux reservation in South Dakota on energy efficiency improvements for housing. Moore said he and the workers interacted with the Osage public and took the region into consideration when developing plans for the subdivision. He said many people told him “community” is important. “Ultimately planning and designing can really make a difference, home is very much where the heart is,” Moore said. Moore said the housing plans call for the units to be compliant with the Americans with Disabilities Act (ADA) and native-area plants, trees and grass would be used for the landscaping. 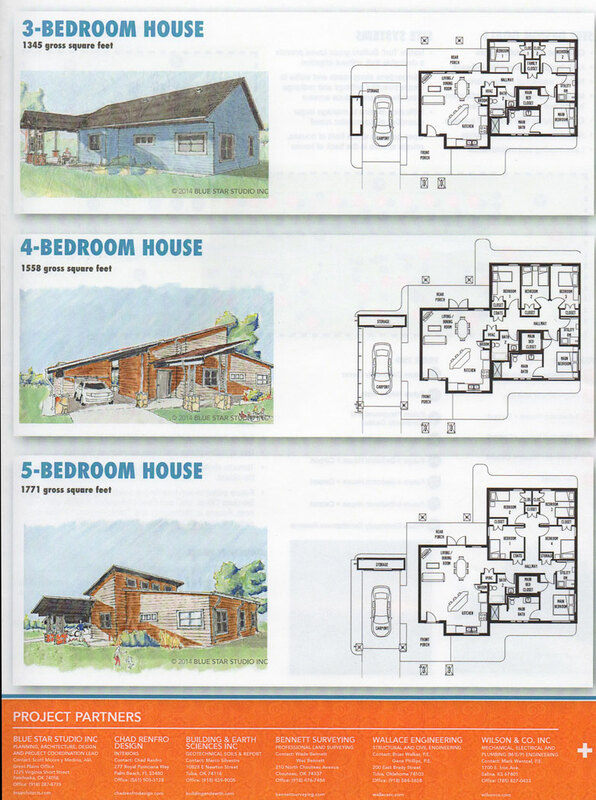 Also according to the plans, each house would contain a carport and a storm shelter. The division would also include signage in both English and the Wah-Zha-Zhi languages. The plans call for the housing to be built in two phases with groundbreaking occurring early next year on the first one. Phase one comprises up to 25 houses with three, four and five bedrooms options with 15 designated as three-bedroom houses and five each for the four- and five-bedroom housing units. The houses will be built in a subdivision with six streets (including four cul-de-sacs). Kemble said ground breaking could be held in February or March of next year pending future action on the plans including selection of hiring a construction company.